Infrastructure simplification is a concept popping up very often lately with IT managers across all kinds of organizations. But it’s nothing new for small, and budget constrained IT shops that have always looked at ways of keeping their infrastructure simple, very manageable and highly serviceable. 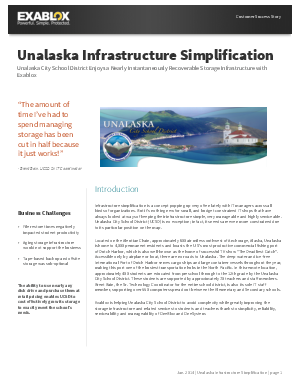 Unalaska City School District (UCSD) is no exception; in fact, its needs are even more constrained due to its particular position on the map.